Building a broad, effective organization will take months of planning and Fizdale didn’t want to wait that long to get started. 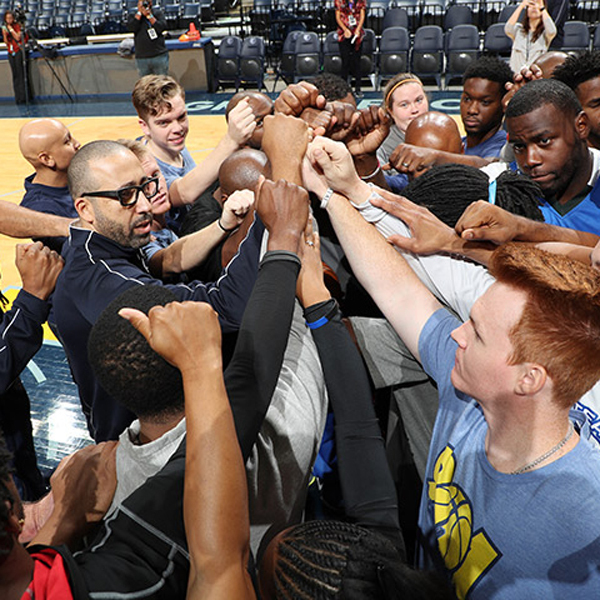 The compromise was to start right away with a basketball mentor program while simultaneously working on the bigger vision.. For Fizdale the Grizzlies’ Community Engagement team and local organizations, Friday’s coaching clinic served as a launch point for the season. The Memphis P.A.L. basketball program will start with two 8-week seasons that allow 100 boys ages 13 and 14 to represent teams from eight Memphis Athletic Ministries community centers across the city. The league season opens Dec. 10, with police officers working as assistant coaches at each location alongside Grizzlies staff. That made Friday’s session with Fizdale and his top assistants a training camp of sorts for men and women from all ages and backgrounds who showed up on the same court where the Grizzlies’ coaches guide Marc Gasol, Mike Conley and Zach Randolph on game nights. First, police officers and community volunteers had to grasp the concepts of Grizzlies’ practice. Fizdale opened Friday’s function by detailing some of his past experiences with police while growing up in South-Central Los Angeles during the height of gang violence and anti-police riots in the 1980s and 90s. While admitting “some of my best friends were two-time felons, gang bangers or dead,” Fizdale also explained how D.A.P.S – Los Angeles-based community engagement program similar to P.A.L. – offered several kids in his neighborhood an alternative through sports, mentoring programs and field trips.